Recently I’ve been having a lot of fun painting up some of Soda Pop Miniatures’ anime-inspired Relic Knights line. If this is the first time you’ve heard of Soda Pop, you should consider visiting their online store. 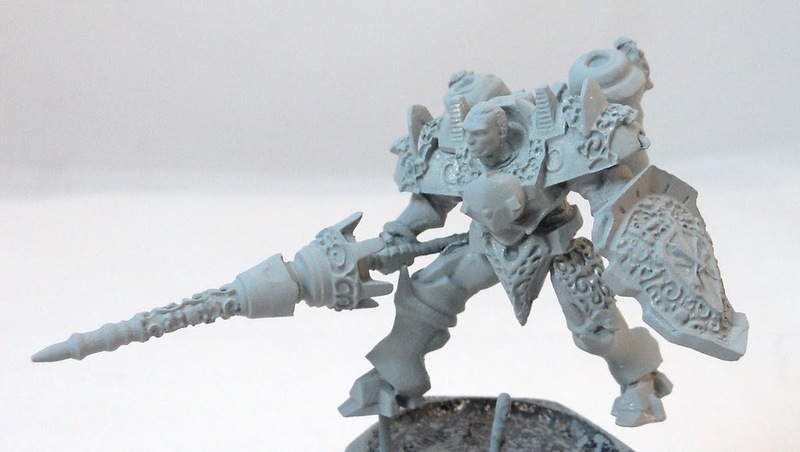 They’ve got a lot of really cool unique sci-fi minis that are worth checking out. While the game that accompanies these miniatures won’t be officially released until this year’s Gencon, I’ve played demos of it at a couple of conventions. The model count is pretty low, maxing out at around five minis in an average size game. So I’m happy to spend some extra time painting these great sculpts. This means a chance at practicing my non-metallic metal techniques; something I’m still trying to master. Navarre here is one of the Shattered Sword Paladins. I haven’t deviated too much from the studio color scheme for mine. 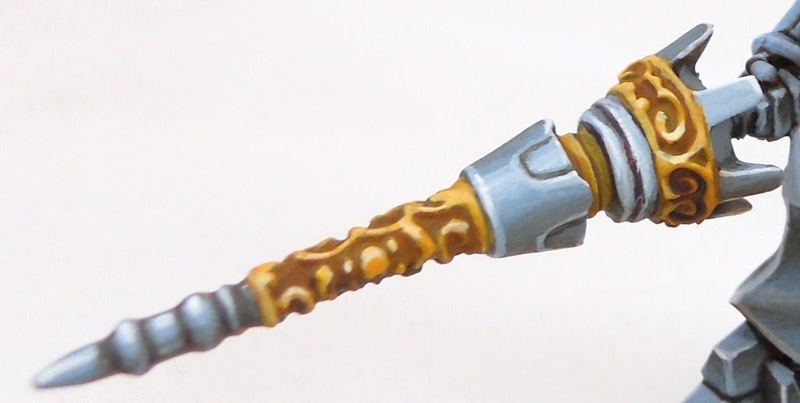 I’ve gone for a somewhat more blue-tinged NMM effect with the armor, and kept my golds a little warmer in tone. With all the different shapes making up his armored form I knew Navarre was going to be a special challenge to paint in a non-metallic style. 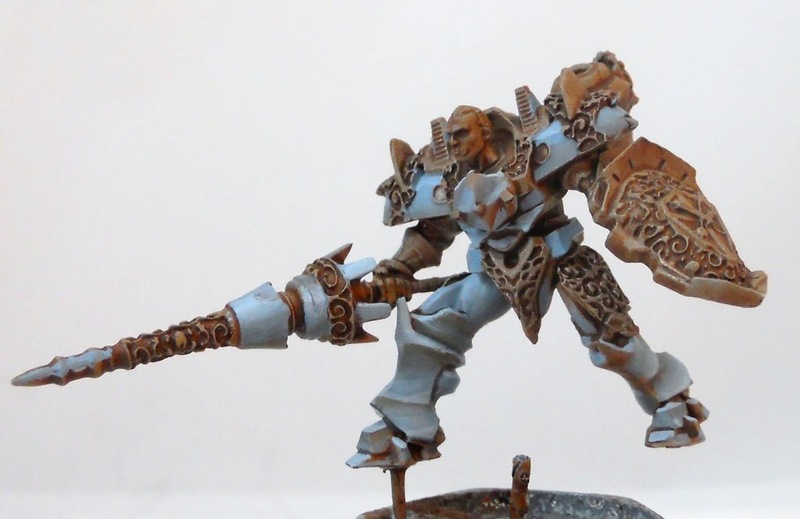 There’s a reason why painting NMM can be so daunting. Doing it properly means creating an illusion of light reflecting off of a metallic surface. 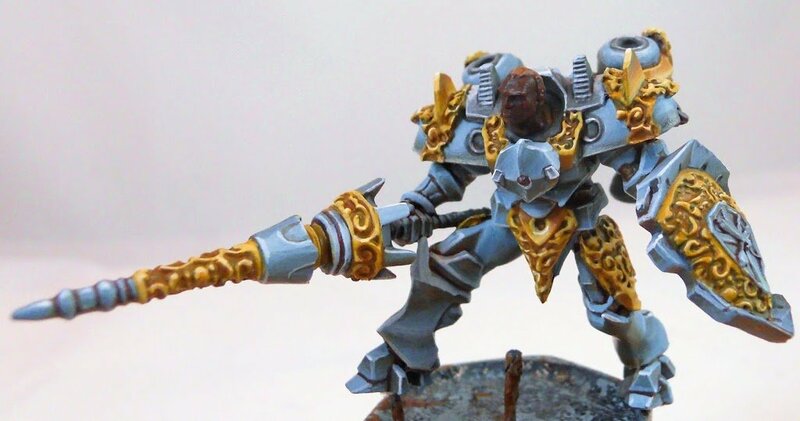 This means all the usual wisdom about highlighting and shading is going to get turned around a bit since every metallic surface reflects light differently depending on its shape. Whenever I’m working on a project using Non Metallic metals, I find myself becoming more keenly aware of the metallic surfaces I see in everyday life. I’ll catch myself staring at metal faucets, or the chrome bumpers of cars ahead of me when I’m stuck in traffic. Even the most mundane objects will help instruct on NMM techniques. Let’s take a look at this close-up. 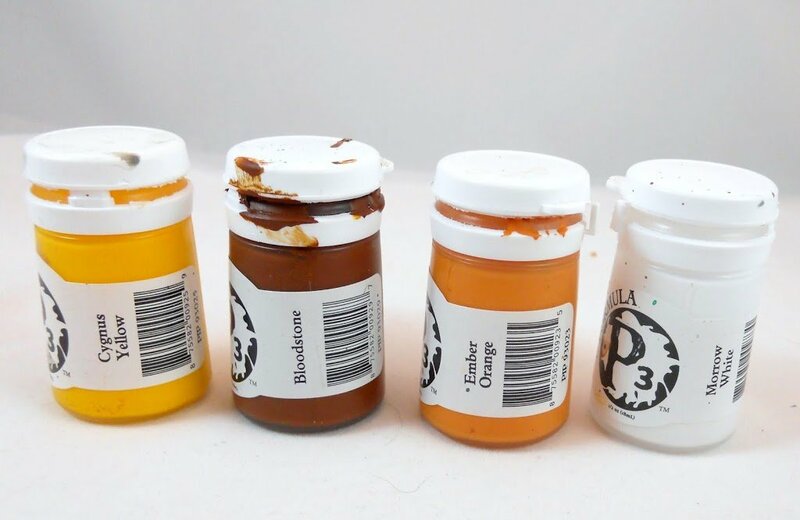 One of the easiest ways to get a NMM appearance on a perfectly flat surface is to keep the darkest areas towards the top, and blend down to a lighter tone as you get closer to the bottom. The last step is to add a thin line of extreme highlight across the top to represent light reflecting off the surface. Check Navarre’s foot above to see what I mean. But since not every surface is going to be a perfect plane, sometimes you’ll have to think a bit harder about how to do your shading. The lower leg in the above shot is a perfect example. This curved fluted surface required a more complex gradient to create the illusion of metal. In this case it was just to double up on the usual gradient, going from dark to light to dark and back to light again. This creates the illusion of light reflecting off the interior of the curved surface. Other surfaces will require still different techniques. For a cylindrical shape like the lance here, you’ll want to create a line of extreme highlight running down a central area, then blend outwards to an increasingly darker tone. 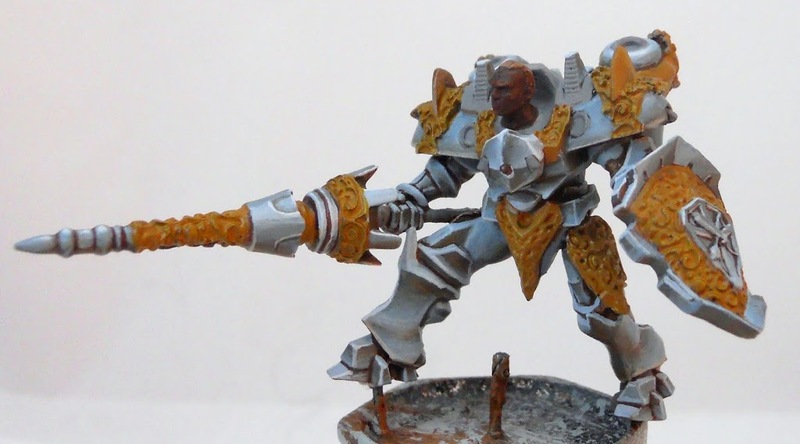 You may want to create two such highlight lines so the effect is visible when viewing both the front and back of the miniature. In a situation like this, when the cylindrical object is being held at a near parallel angle to the ground, it can help to add another highlight along the very bottom of the surface to represent the ground reflecting off the bottom. For more spherical objects, like the oval shapes towards the tip of the lance, start with a central highlight point, then blend darker as you move out from there. 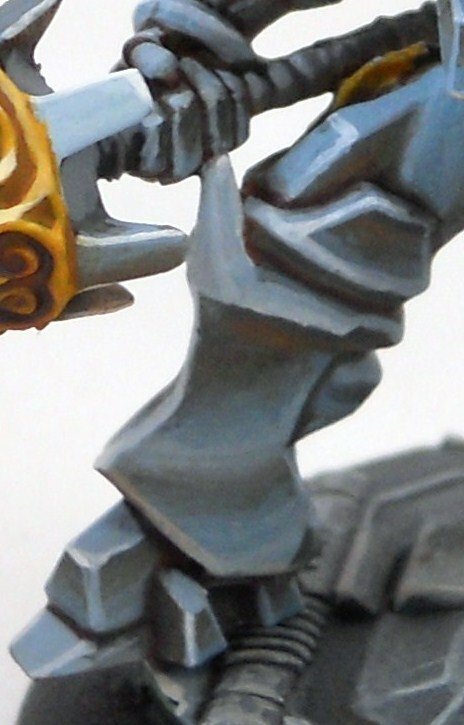 When painting NMM, color choice is almost as important as highlights and shadows. 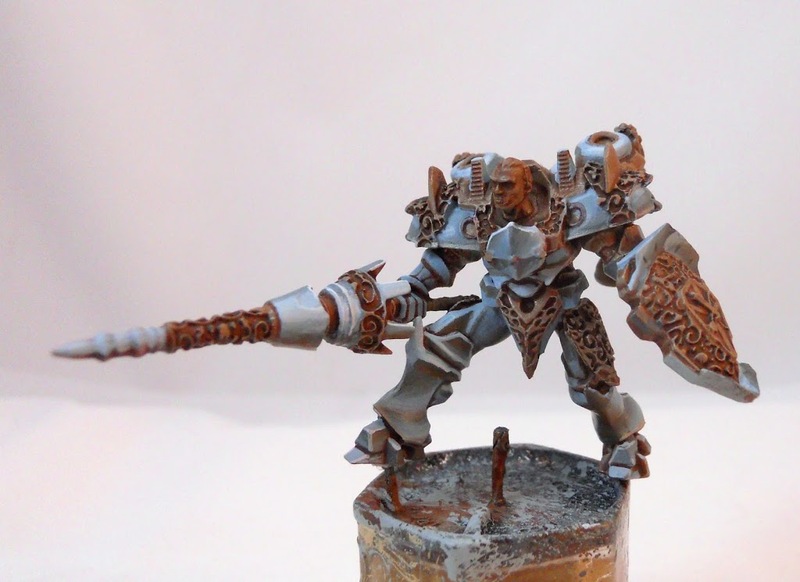 Many beginners to NMM often use a pure gray scale with no added color. 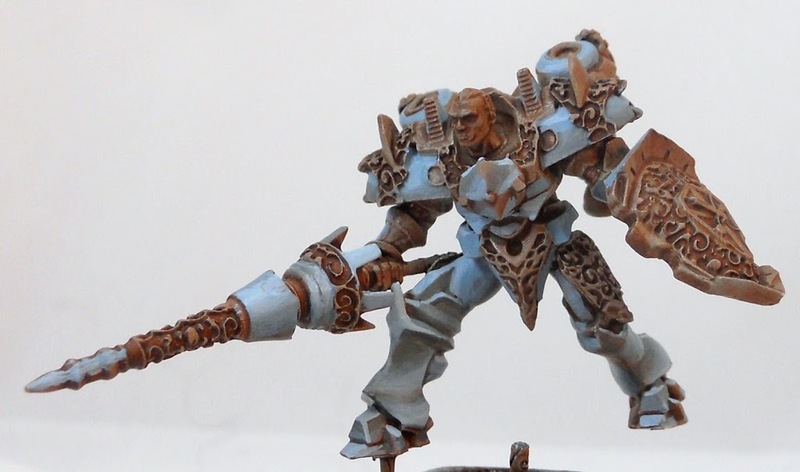 While I did want this model to have a particularly blue tone to it, any NMM painter should consider adding some color to their grays. Blue works especially well when added to highlights to represent a blue sky reflecting off of the metallic surface. Similarly warm colors will look good when added to shade tones. In addition to representing the ground reflecting off the metal, the warm and cool colors create a strong visual contrast that will help create the illusion of metal. Other colors can help create a more surreal appearance, or represent the reflections of colored objects. 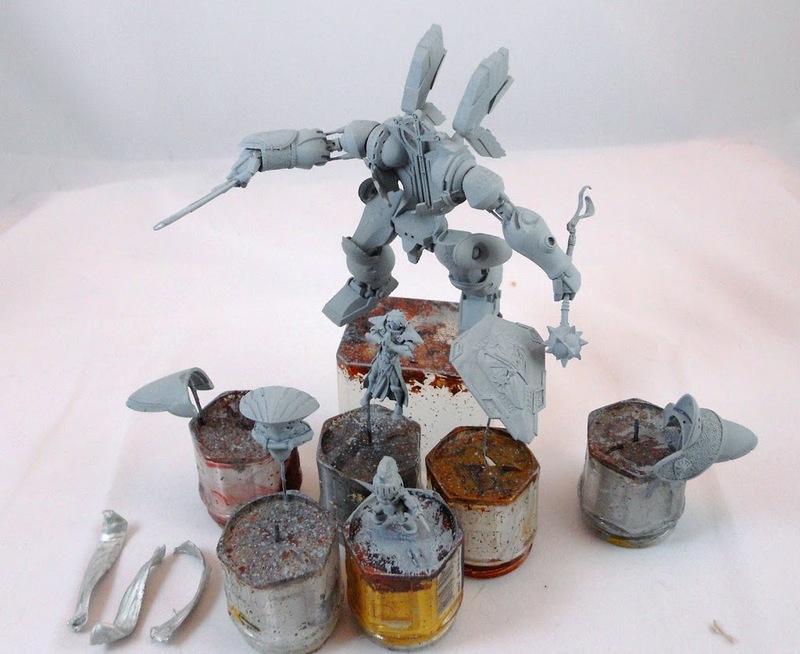 To complicate things even further, different types of metal require different methods of painting. I wanted Navarre’s armor to have a reflective appearance somewhere between steel and brushed aluminum. Getting the appearance of different metals will require you to increase or decrease the level of contrast between highlights and shadows, and the amount of color in those highlights and shadows. Pure steel for example looks good when painted with higher value contrast and less color. So… darker darks and brighter highlights, but more of a pure grayscale when it comes to the colors. For something like aluminum you would keep the contrasts less extreme and the values a little more pale. Finally for a chrome effect, you would kick the contrast up to maximum and incorporate a ton of colors into your tones. 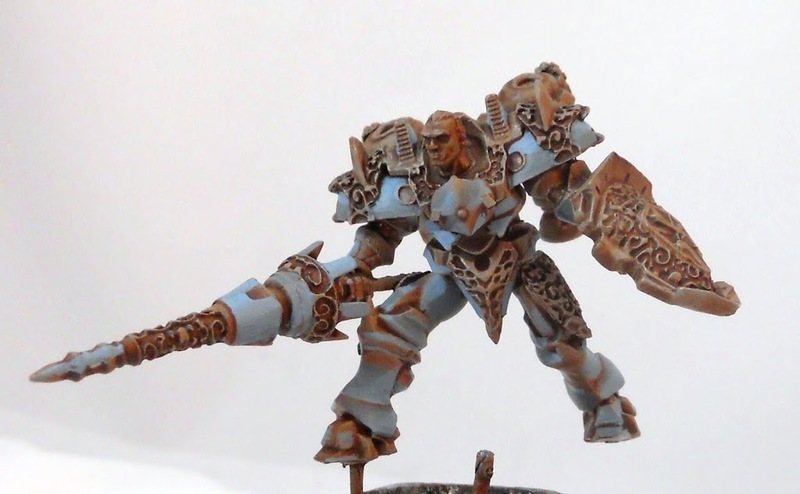 In fact really good chrome NMM is done by painting a mock landscape: a blue sky that meets up with a dark horizon line that then blends down into a lighter warmer brown. I’ve been trying out different brands of paint lately. This time it was Vallejo’s Game Color. 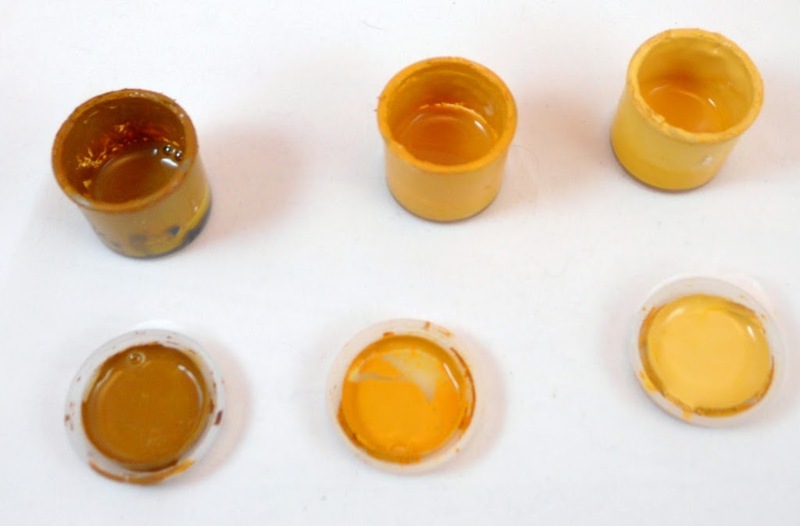 All of my metal tones began as these seven different colors. And here are the tones I ended up with. 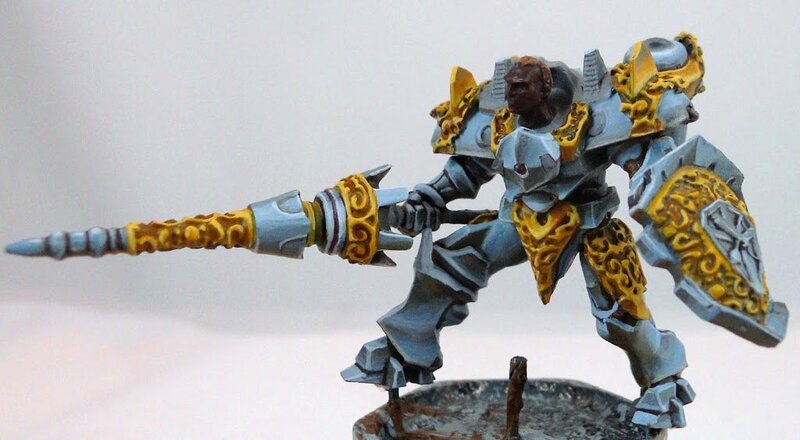 I’ve got a very pale blue-gray for most of the highlighting. 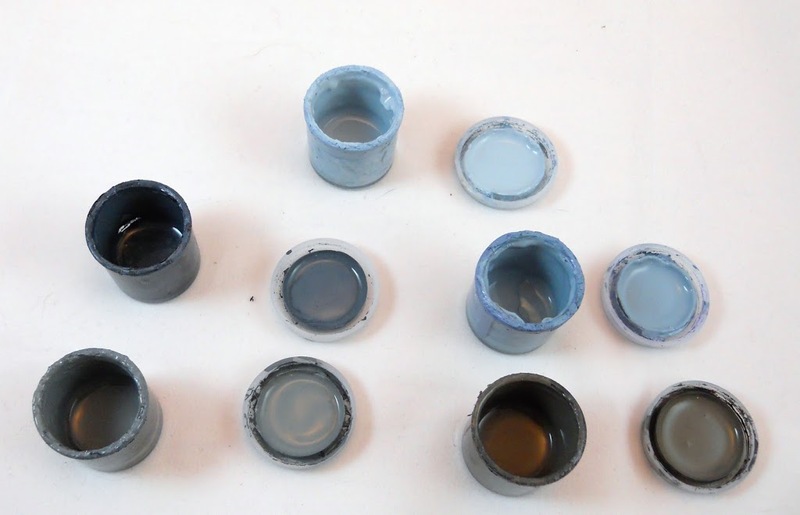 I have two mid-tones; one more bluish and one more grayish. And I have two shadow tones: one a little more cool and blue, one a little more warm and brown. These five core colors were sort of used as a starting point and altered quite a bit during the painting process. I frequently added pure white (P3’s Morrow White in this case) to the highlights, and more of the Vallejo Earth to the darker tones to warm them up some. And of course I mixed them with each other quite a bit throughout the process in order to blend them. I started off with GW’s Astronomicon Gray as a base coat. I think these days they’re calling it Celestra Gray. 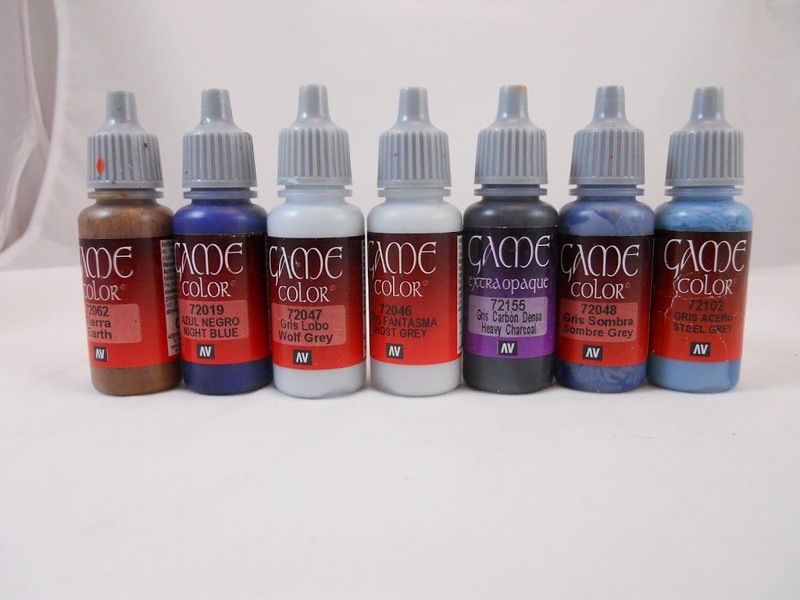 The GW paints I did use on this project were all purchased before their big color change-up so all the names I’m going to throw around will be out of date. Nothing like having to learn the names of your favorite paints all over again. Next I give the whole thing a wash with a mix of Devlan Mud and Bestial Brown. Like I said before I want warm tones in the shadows so I figured a wash with a nice warm brown would work nicely. With the wash dry I began to add some mid tones to begin defining the surfaces. I continued by adding more highlights and more shadows. Then more. Once I’m satisfied with the armor I add the gold basecoat. 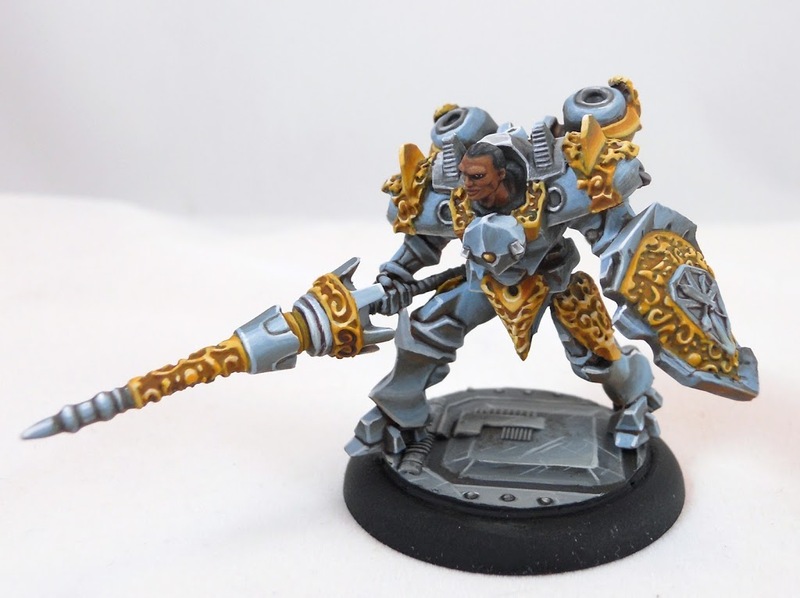 I also pick out a few details with Codex Gray. I’m going to highlight these areas with just gray to try to give them a little visual distinction from the rest of the armor. 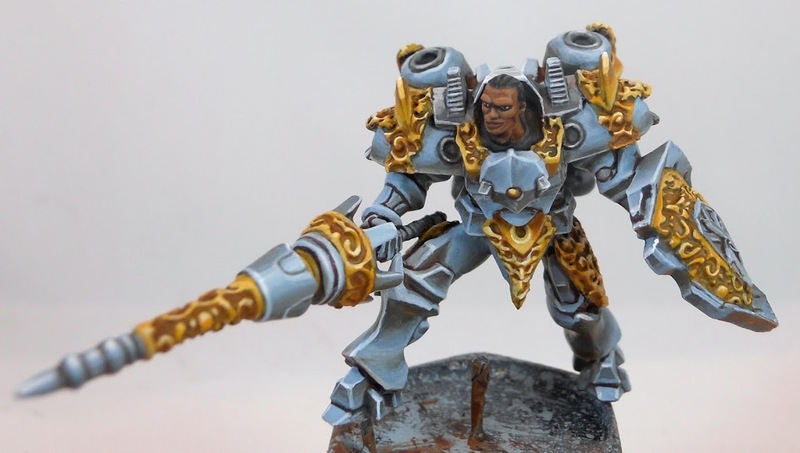 I used colors from the P3 range for my NMM golds. The basecoat/shade is mostly bloodstone with just a bit of Ember Orange and Cygnus Yellow mixed in. A little bit of orange and yellow along with a fair bit of white are added to the basecoat to get the midtone. Then more white and some yellow are added to the Midtone to create the highlight. Next, I wash the gold basecoat with thinned down Asurmen Blue. Then highlight it back up with the basecoat color before starting to add some of the midtones. Then I add the final highlights, first with the color from the pot above, then with some final accents with a little extra white added so they really pop. Then I finish up the few silver areas adding highlights to the gray with Morrow White. I give everything some final touch ups, and then its time to paint the face. I start it off with a base of GW’s Scorched Brown which I then highlight up by blending in increasing amounts of Vallejo’s Heavy Skintone. After all the work I’d put in, I wanted Navarre to have a cool base. Unfortunately there aren’t many companies out there doing any cool sci-fi bases in the round lipped style Relic Knights uses. The few that exist tend to have either a wasteland or a modern industrial appearance to them. Neither of those styles were really what I wanted. 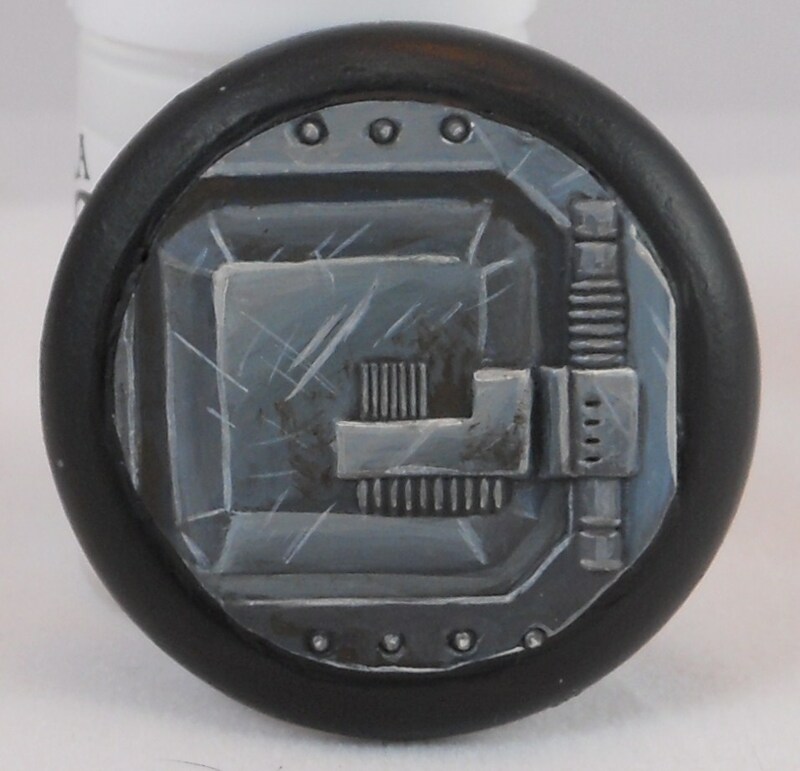 To make my own, I took a panel from a Pegasus Hobbies Platformer terrain kit, and carefully cut it to fit a 40mm round lipped base. I painted it using the same colors as on Navarre himself, but with some Vallejo Heavy Charcoal mixed in to darken it up a bit. And there he is attached to his base. I’m definitely pleased with the results, but Navarre was really just practice for the main event: the Relic Knight Sebastian Cross. ~ This one’s going to take a little more time I think.